Jordan Bernloehr in BC RACE CARS TA2 07 Millers Oils ProKART Indoors Burnsville AirJax Camaro racing for 5th place at the Watkins Glen event on May 15, 2016. 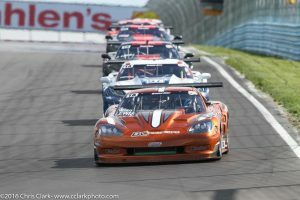 5th at a cool Watkins Glen! 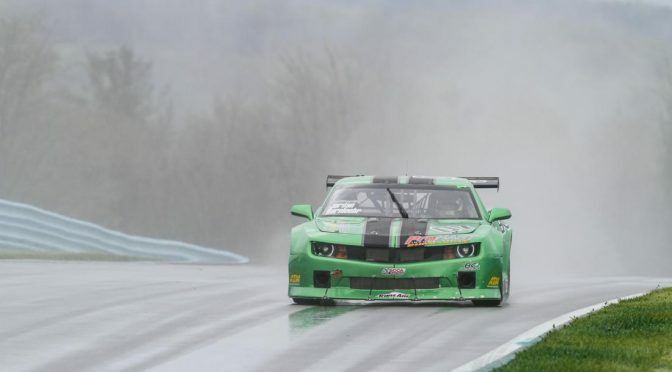 Round 3 of the SCCA Trans-Am series was held at picturesque but freezing Watkins Glen, NY. The track has been recently repaved and is glass smooth, a factor that we considered in our set-ups. Jordan Bernloehr did us all proud when he finished 5th in our Millers Oils, Pro-Kart #07 TA2 Camaro, as we did not think we were about to have such a good run. We barely got any practise due to rain and red flag conditions, and Jordan had never driven at this track before. 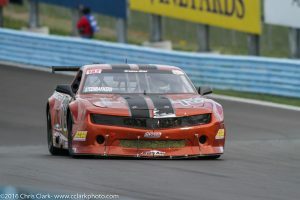 We qualified 12th, but after reviewing telemetry we knew that there is more to be had in his driving. 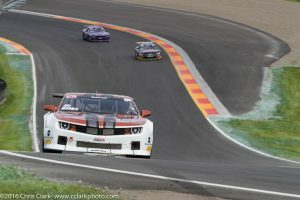 The turning moment in the race came when he let fellow competitor and legendary driver Tony Ave pass him on a restart and followed him to learn. And to school he went; within 6 laps his lap times dropped almost 2 seconds/lap and eventually repassed Tony for 5th place. Smartly done! Harry Steenbakkers in the #78 BCR/Millers Oils TA2 Camaro was quick out of the gate. We played with set-up and were looking forward to a super qualifying session. Unfortunately, Harry was badly blocked on his “honey” lap, ending up 13th. The race was equally disappointing as he was caught up in a first corner crash and had to struggle thru the entire race with a bent front suspension. Still came in 13th, a testament to his skills! Mike McGahern in the #48 BCR/Millers Oil TA2 Camaro also had a tough start to the weekend, trying to find speed at this track. Luckily we had Harry’s data and thru telemetry analysis were able to pin-point where improvement was needed. Thank you Harry! 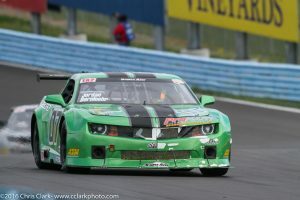 Mike rose to the challenge, drove a great race and ran very quick lap times to finish a well-deserved 12th! Allan Lewis was our only entry in the TA class. Lack of track time hurt us a bit, and it started to rain on lap 2 of qualifying. Luckily Allan had already driven a lap good enough for 8th! During the race, a 35 cent fuel pump fuse put him out of the race, ending our almost flawless reliability record with that car in the last 18 months of racing! New Jersey is next on our schedule, June 11-12.